Congratulations to our members who are out on the competition circuit around the county keeping me busy with new club records.Dave Quemby (compound/longbow),Pamela Joseph(compound),Heather Major(recurve bare),Susan Corless(compound) and myself as it goes(flatbow). To all members feel free to check the records section of our website after competing in our own internal competitions,you can download and print off the claim form and hand to me with a copy of the results.Alternatively submit your claim online. Give yourself and others a score to beat in the future. Also well done to those participating in the 252 Badge award scheme and achieving success.Dave Fleming(30yds),David Taylor(50yds),George Bond(50yds),Nevile De Sousa(50yds) ,Heather Major(60yds) oh and lil ole me (80yds). 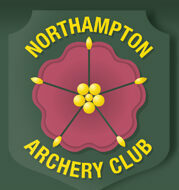 For newcomers to the club,all info can be found on our website regarding our indoor and outdoor award schemes,and they are a great way to plot your progress in archery.